Last week, the GOP-controlled Senate explained why there supposedly wasn’t enough time before an extensive summer recess, the longest in 60 years, to confirm numerous long-standing consensus judicial nominees. In fact, they spent more time making excuses than it would have taken to actually confirm the nominees. The exchange revealed new depths to which Senate Republicans will sink in order to avoid doing their jobs and voting on the president’s nominees to our lower federal courts, in addition to their unprecedented refusal to even consider the nomination of Merrick Garland to the Supreme Court. On Wednesday, July 13, Democrats sought votes on many of the nominees waiting for Senate action. First, Sen. Chuck Schumer asked for votes on the 13 longest-stalled district court nominees, all of whom had been approved by the Judiciary Committee with unanimous or near-unanimous support, as well as seven nominees for the Court of International Trade and Federal Claims Court (six of whom had been approved by the Committee in 2014, then again in 2015). On behalf of the GOP leadership, North Carolina Sen. Thom Tillis blocked the vote because, among other things, the Senate had confirmed one judge the previous week and one judge the week before that. In fact, vetting and confirming judges so that the United States judicial system can function and provide a forum to protect people’s rights is among the most important responsibilities the Constitution gives to the Senate, and to the Senate alone. There was apparently no number low enough or waiting period long enough that Republicans would accept. Sen. Mazie Hirono sought a vote only on the eight longest-stalled district court nominees, who would fill vacancies in Tennessee, New Jersey, New York, California, Rhode Island, Pennsylvania, and Hawaii. All were approved by the Judiciary Committee without opposition. Half had been approved in the fall of 2015, three back in January, and one had been waiting for “only” three months. Yet again, Tillis objected, urging the Senate not to waste time on this issue but to address other issues. Actually, the waste of time came from Sen. Tillis, who spent far more time blocking votes on qualified consensus nominees than it would have taken to actually confirm them. Mitch McConnell’s Senate is a far different place than it was on September 26, 2008, an election year, when the Democratic-controlled Senate confirmed ten of President Bush’s consensus district court nominees in less than a minute, nominees who had been waiting for a vote for only three days. As Tillis carried out McConnell’s obstruction directives last week, Republican senators who claim to support the nominees from their home states were nowhere to be found. Tennessee’s Edward Stanton III has languished on the Senate floor since October of last year, but Sens. Lamar Alexander and Bob Corker were nowhere to be found to offer them support when Tillis blocked a vote on him three separate times. Similarly, Pennsylvania’s Pat Toomey allowed two nominees he had recommended to the White House to be denied votes three times that day, even though they were approved by the Judiciary Committee six months ago. Rather than being an aberration, Republican efforts to block confirmation votes for President Obama’s judicial nominees have been the norm. While their refusal to even hold a hearing for Supreme Court nominee Merrick Garland has grabbed the headlines, the GOP’s deliberate sabotage of the rest of the federal judiciary is nothing new. Since Republicans have taken control of the Senate, the pace at which they’ve chosen to process all judicial nominations has fallen far short of what precedent would dictate. Failing to confirm judges has never been the norm even when the Senate and the White House are held by different parties. A useful basis of comparison is George W. Bush’s final two years in office, when Democrats took over the Senate after the 2006 midterms. In 2007, the first year as the majority, the Democratic Senate confirmed 40 of President Bush’s circuit and district court nominees (with a total of 68 by the end of 2008). In stark contrast, the McConnell Senate has confirmed only 20 circuit and district court judges during this Congress (along with two Court of International Trade nominees). Just as the number of confirmations last year (11) was the lowest since 1960 (also 11), the total for this two-year Congress appears on track to be the lowest since the Eisenhower era, when there were hundreds fewer judgeships than today. 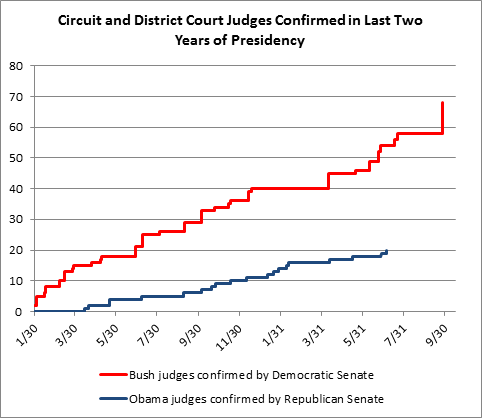 The figure below shows the stark difference in the pace of circuit and district judicial confirmations under today’s Republican-controlled Senate as compared to the Democratic-controlled Senate of Bush’s last two years. Another way of contrasting how seriously Senate Democrats took their job in 2007-2008 versus the attitude of Republicans today is to track the number of vacancies. Judicial vacancies open regularly and predictably, since judges usually announce their intent to retire or go into semi-retirement up to a year in advance. 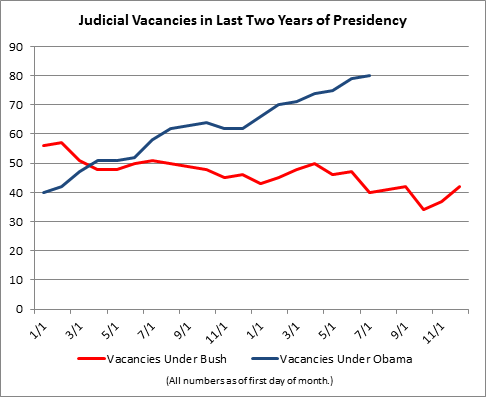 Just to keep the number of vacancies at an even level requires that several new judges be confirmed each month. At the beginning of 2007, there were 56 circuit and district court vacancies. Throughout the next two years, the number of vacancies generally remained at 50 or fewer, getting as low as 34 in the early fall of 2008. Because an unusually high number of vacancies opened up after Election Day, that number climbed back to 55 by Inauguration Day, but even with that increase, the number of vacancies ended up at about what it had been two years earlier. Today, in stark contrast, the number of circuit and district court vacancies is climbing, more than doubling from 40 at the beginning of the year to 81 today. We see the same thing with judicial emergencies, a formal designation assigned by the Administrative Office of U.S. Courts for vacancies where the caseload per judge is so high that it endangers access to justice. 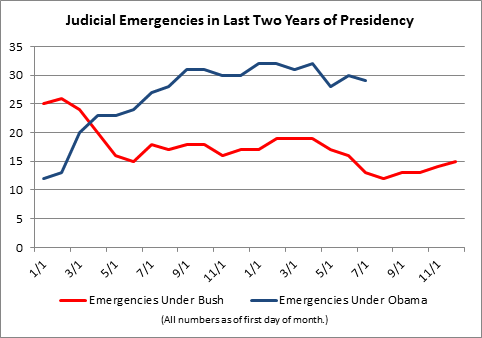 Judicial emergencies have skyrocketed from 12 at the beginning of the new congress to 29 as of July 15 of this year*. As the chart below shows, Democrats in the Senate during Bush’s last two years did not allow the number of judicial emergencies to increase in a similar fashion, and in fact the number generally remained steady or decreased during most of those two years. The American people expect their elected officials to try to solve problems. At the very least, the American people demand their senators to at least show up to work on a regular basis. But Senate Republicans have done neither. Instead, they are setting dubious records for the fewest working days and the fewest judges confirmed. Republicans have denigrated this institution with their obstruction. I hope they will consider the consequences of their inaction over this seven-week vacation. Courts are the infrastructure of justice, just as important to our constitutional rights as roads and bridges are to transportation. Either in spite of this or because of this, Senate Republicans have abused their position in the majority to stymie President Obama’s efforts to put qualified people on our nation’s federal courts. In so doing, they are weakening the entire third branch of the United States government. * – Judicial emergencies are based on caseloads, which are weighted to reflect the wide variations in time and resources generally associated with different types of cases. On April 15, the Administrative Office of U.S. Courts list of emergency vacancies began to incorporate a new weighting system adopted a month earlier by the Judicial Conference of the United States. As a result, the number of officially designated judicial emergencies dropped from 34 on April 14 to 28 the next day, a drop that had nothing to do with Senate action.